Kings Acres provides hardwood furniture made by skilled craftsmen, giving you the opportunity to purchase quality made furniture at a fair price. A fine selection of solid hardwood furniture. Any display piece can be taken home with you when you visit the showroom or you can order a piece to be made specifically for you. With a little care all your furniture purchased at Kings Acres will be an heirloom that can be passed down to future generations. Need furniture for any room in the house? Visit Kings Acres for a wide variety of furniture, you don’t need to second guess your decision or double check the construction. We are here to help you create beautiful spaces that work well for you family and display your family’s character. Many memories can be made around the table eating, hosting friends, and working on projects. Here you’ll find tables that exceed expectations in quality. All tables are available in a variety of wood types and stains. 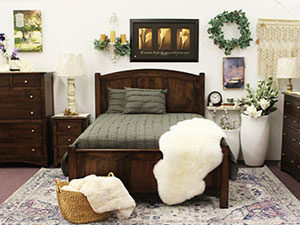 Your bedroom is an oasis in your home, a quiet place of rest where you both start & end your day. Kings Acres showroom boasts of ten bedroom collections to get your creative juices flowing and dreaming of your own customized oasis where you can rest easy. 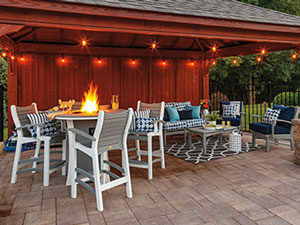 Tired of outdoor furniture that needs constant maintenance or that blows around the yard during storms? 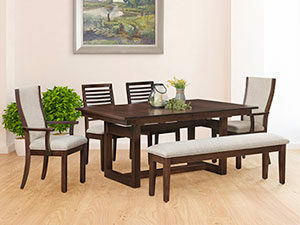 Try our heavy duty, weather-resistant polywood furniture. It is ideal for your porch, patio, backyard, or deck. With the variety of styles available, you can add a splash of cheerful color to your surroundings or choose natural hues. 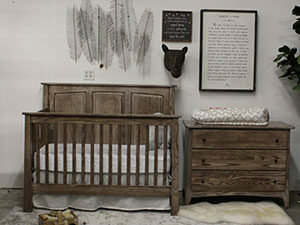 American made cribs meet federal standards and are made to grow with your child from infant to his college years as all cribs can convert into full sized beds.